Offering a couple good jolts amid a lame storyline, The Village continues director M. Night Shyamalan’s battle with hype over logic. Set in a quaint, puritanical village, Shyamalan’s latest tale picks up on the same themes set forth in his previous films: love, loss, and confronting the darkness that surrounds us all. In his breakthrough film, The Sixth Sense, Shyamalan told an elegantly simple ghost story that was impeccably acted by Bruce Willis and Haley Joel Osment. The director hit something akin to the sophomore slump with Unbreakable, an impenetrable and cold tale that tried to blur the boundaries of comic books and reality. With Signs, he once again achieved popular success with the simple message that “everything happens for a reason,” a naturally appealing theme in a post-9/11 world. In The Village, Shyamalan makes an anti-isolationist statement, but in doing so, he serves up a story sparse on chills and thrills and long on plot holes. This time, Shyamalan tries to outsmart audiences by piling on numerous elements, some of which instantly fall flat, as he weaves an ever more convoluted tale. From the outset, Shyamalan cheats, by what is said and what is not said, by what is shown and what is not shown. Working to The Village’s disadvantage is its very premise. The story revolves around a group of people that have cut themselves off from the rest of society (“The Towns,” as the outside world is referred to) for a myriad number of reasons. As a result, considering their small number, the end game of what must ultimately be termed “inbreeding” has led to an incredibly high per capita rate of neurotics, psychotics and otherwise imbalanced folks, too many of whom harbor deep, dark secrets and suppressed emotions. Lacking modern medicines and living by a suffocating number of superstitions about what lies in the woods, it might occur to one or two villagers that perhaps the life they have struggled so hard to live might be better lived a couple grassy knolls down the road, away from the nasty creatures threatening their lives and decimating their livestock with shockingly frequent regularity. But such thoughts would lead, for better or worse, to no movie. Instead, these villagers live in terror of the color red, for it attracts the beasts of the woods, referred to simply as “Those We Don’t Speak Of.” It’s a shame, though, that this collection of desperately innocent people don’t realize their greatest dangers are generated from within. Instead, these peaceniks are bound to convictions of holistic healing and are led by elders who apparently swam in the same gene pool that burped up Jim Jones and David Koresh. In short, it’s hard to care for this lot. Even though the entire village lives under the cloud of impending horror, their biggest threat is still man’s own inhumanity to man. And so it is that Noah Percy (Adrien Brody, The Pianist), a mentally malnourished young man, sets the village on edge with a nasty knifing incident against Lucius Hunt (Joaquin Phoenix, Signs). Having become engaged to Ivy Walker (Bryce Dallas Howard, How the Grinch Stole Christmas), Lucius receives the jealous wrath of the highly unstable Noah, who sets in motion the unraveling of many, many secrets. 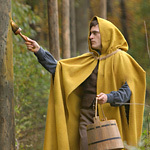 The only hope Lucius has is if his beloved can make it to The Towns to retrieve medicines. Accompanied by two young men who quickly bail out because of paralyzing fear of what lies beyond the perimeter of their psycho village, Ivy forges ahead on her own and unwittingly discovers the film’s much-hyped, but obvious, secret. After Edward Walker (William Hurt, A.I. : Artificial Intelligence), the head elder, lets Ivy, his own daughter who lost her sight as a young girl, go to The Towns in the name of love, a villager challenges him with the line, “You have jeopardized everything we’ve made!” Huh? Listen, lady, you have “made” one of the most unhealthy living environments imaginable! To be proud of what you have “made” in favor of what you have “escaped” is a debatable sentiment. Perhaps it’s time Shyamalan take a breather and come to terms with the fact that even Rod Serling didn’t knock it out of the park with every episode of The Twilight Zone. Amidst the unraveling story, there are still some very nice character-driven scenes, particularly between Lucius, Ivy, and Kitty, the only villager with a gregarious personality. The less familiar talent of Howard and Judy Greer (13 Going on 30), as the two young ladies at the story’s heart, turns in by far the film’s best performances, outshining by many a megawatt their higher-priced colleagues. Those big names, Hurt and Sigourney Weaver (Alien) in particular, turn in shockingly poor performances. Their delivery of Shyamalan’s puritan, klutzy, quasi-early American dialogue is bafflingly stilted, as if they’re struggling to grasp the circumstances that require they speak that way. The hackneyed acting aside, Shyamalan maintains — and even finesses — his technical expertise. The lighting of intimate scenes of conversation is nicely moody and the ever-grey sky creates a murky, foreboding atmosphere. Such technical virtuosity isn’t enough, though, to rescue the story and the characters. Sure, there’s cleverness in the tale, but it’s not clever enough to stay a mystery much past the film’s opening sequences. Shyamalan actually becomes too clever for his own good and he virtually acknowledges as much by trying to explain away technical considerations during an oddly one-sided conversation. It’s reminiscent of the awkward analysis Hitchcock tacked on at the end of Psycho and it’s equally unnecessary.